Commercial Fracking began in the early 2000s in Texas in the Barnett Shale. There are three types of product that come out of shale formations, natural gas, tight natural gas, and light tight oil. Natural Gas and Tight Natural Gas are only distinguished by the geological formation they are found in. Light Tight Oil is defined by it being found in low permeability formations such as carbonate and shale formations. The identification of tight natural gas as a separate production category began with the passage of the Natural Gas Policy Act of 1978 (NGPA). This was done to remove tight natural gas from existing regulatory frameworks and allow its price to be purely market determined and encourage increased exploitation. There are two key developments that make fracking possible, hydraulic fracturing and horizontal drilling. Hydraulic fracturing is the injection of high pressure fluids and chemicals to break up formations and permit a flow of natural gas to the surface Horizontal drilling is the key technology to making fracking commercially possible. Tight oil formations by their nature do not give up their contents easily. They must be broken up by hydraulic fracturing to release oil and natural gas. Horizontal drilling allows a far larger area to be fracked from a single borehole, meaning far less expense compared to previous vertical drilling tech which required many wells to be drilled to access the same formation. 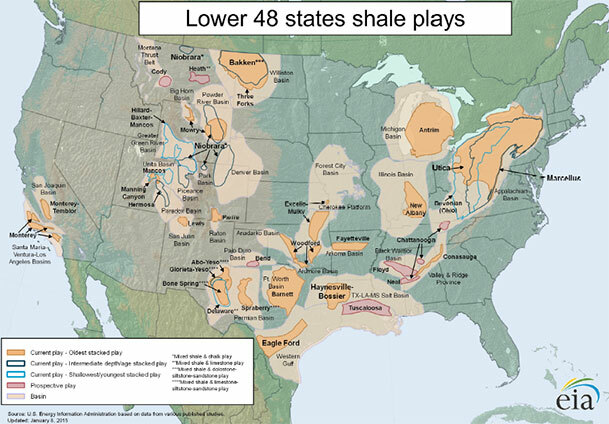 Shale formations in the United States of America are concentrated in Texas and the Appalachian basin. The Bakken shale is also of note, as its proximity to the proposed Keystone XL Pipeline is central to its profitability by reducing its transport costs to the refineries on the east coast and in Texas. The United States is ranked second in light tight oil and fourth in tight natural gas reserves. The graphs below illustrates the shale formations in the United States and where the majority of fracking is being conducted.